Qurratulain Haider was a renowned Urdu fiction writer, novelist, short story writer, and journalist from Pakistan. 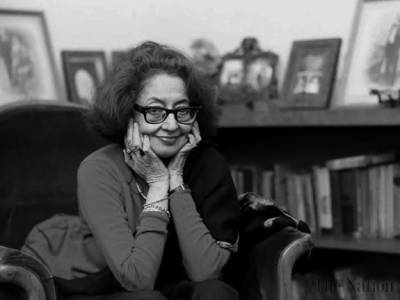 Her Magnum opus was Aag Ka Darya (River of Fire) – a famous Urdu fiction novel which published in 1959 from Lahore. Quratulain Hyder being a novelist and short story writer influenced the Urdu literature. She belonged to a literary family of Uttar Pradesh, undivided British India. Her admirers and friends knew her as ‘Ainee Apa’ due to her impressive writing skills. In this article, we will discuss the most influential Indian Urdu short story writer and novelist Qurratulain Haider. Her biography, literary works, awards & nominations, and much more. Qurratulain Haider was born on 20 January 1927, in Aligarh, UP, British India in a literary family. Her father Sajjad Haider Yildrim was also a pioneer short story writer of Urdu language. Following her father, her mother Nazar Zahra contributed a lot to the efforts of Sajjad Haider. She is one of the most popular Urdu short stories writer, fiction writer, and novelists of all time in South Asia. Her Magnum Opus Aag Ka Darya brought her to mainstream fame in a short period of time. She was named after the Iranian most powerful poet Quratul ain Tahirih which means ‘solace of the eyes.’ She opened the ways for the novel’s writer when there was not enough space for literature. Initially, there was a comprehensive talk about her about River of Fire that whether it is a novel or book. Gradually, it came to cross the readers and found an edge of amazing Indian history. Qurratulain Haider completed her education from Indraprastha College of Dehli. After that, she studied at Lucknow University Isabella Thoburn College. Since the creation of Pakistan, she moved to Pakistan along with her family and remained there till 1960 to return London. She never married in her life. Quratulain Haider remained guest lecturer at the American Universities of Chicago, Arizona, Wisconsin, and California. Qurratulain Hyder left Pakistan for India just after coming back from England. After leaving Pakistan, she took the Indian citizenship and influenced the people of South Asia. Dehli was her death place where she spent her last days after Mumbai. A distinguished fictionist and short story writer Qurratulain Haider wrote when she was 11. Her literary work includes four collections of short stories and twelve novels including novellas. She also translated some classical works into Urdu. Later, her works were translated too into other languages as well. Aag Ka Darya – River of Fire, a landmark novel tells the hundred years history. It starts from the fourth century BC and ends at post-partition of India and Pakistan. Moreover, the crucial epoch of history came to an end with Qurratulain Haider’s struggles. Padma Bhushan in 2005 – The third highest civil award by the government of India for her contribution to Urdu literature. Padma Shri – the highest civilian award by the Govt. of India. Although Qurratulain Haider was an eminent fiction writer of her time and she has no parallel to her works. There was one and only critic who pointed out to her literary writings. A prolific novelist Paigham Afaqui criticized her magnum opus Aag Ka Darya with some standing questions about the post-partition history and migration. Qurratulain Haider suffered from Lung Illness and died in NOIDA hospital at New Delhi on 21 August 2007. She was buried at Jamia Millia Islamia cemetery in New Delhi. On the death of renowned novelist and short story writer Qurratulain Haider, literary circle went into grief. Even, high officials of India including President, Prime Minister, and Chief Minister of Uttar Pradesh sent their condolence message on her demise. All splendid works of Qurratulain Haider touched on the history with a little mixture of the romantic essence. Now, in this article, the Urdu readers can read Qurratulain Haider’s biography and books. You may also read Fahmida Riaz’s biography & Works.